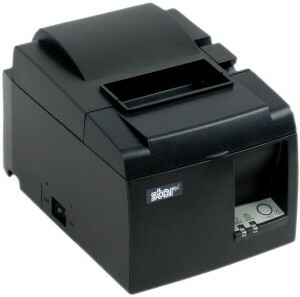 Star Micronics is on the leading edge of iOS based Point of Sale (POS) receipt printing. When it comes to iOS receipt printing (iPad, iPod Touch and iPhone), the standard is AirPrint. I’m not aware of any receipt printers with native AirPrint support so at this point, application based support is your best bet. Star Micronics offers a Software Developer’s Kit (SDK) for POS software developers embracing iOS in the POS market. In fact, they offer SDKs for almost every platform including Android, OS X, Windows and Linux. iOS receipt printing is the most common one that I hear about for wireless printing, and we sell quite a few Star receipt printers. While it is possible to hook up a Star Micronics USB receipt printer to your Apple AirPort wireless base station and print from one or multiple wireless devices, many POS apps require an Ethernet printer. I have personally fielded far too many returns of Star USB printers after a customer couldn’t get it working reliably or at all with their POS system. The lower up-front cost of a USB printer over an Ethernet one can be tempting but you may save time and money by purchasing the Ethernet version from the start. Talk to your software provider. Find out not only which printer models they support, but also which interface and options they recommend. Check out the web for online user communities for your POS software before you make your hardware investment. Find out what other users learned the hard way and benefit from their experience. If you have questions about why there are so many part numbers for the same model, give us a call. Let us help you order the right Star Micronics printer the first time, every time.